How to watch LEGO DC Super Hero Girls: Brain Drain (2017) on Netflix Austria! 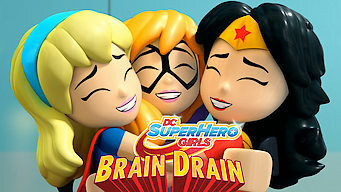 Sorry, LEGO DC Super Hero Girls: Brain Drain is not available on Austrian Netflix. We check Netflix hundreds of times a day, so you can check back regularly to see when it appears for streaming. We'll keep checking Netflix Austria for LEGO DC Super Hero Girls: Brain Drain, and this page will be updated with any changes. Super Hero High School classmates Wonder Woman, Batgirl and Supergirl are expelled for misdeeds they committed during 24 hours they can't remember. An evil villain has given them temporary amnesia. He should have remembered one thing: they're superheroes!